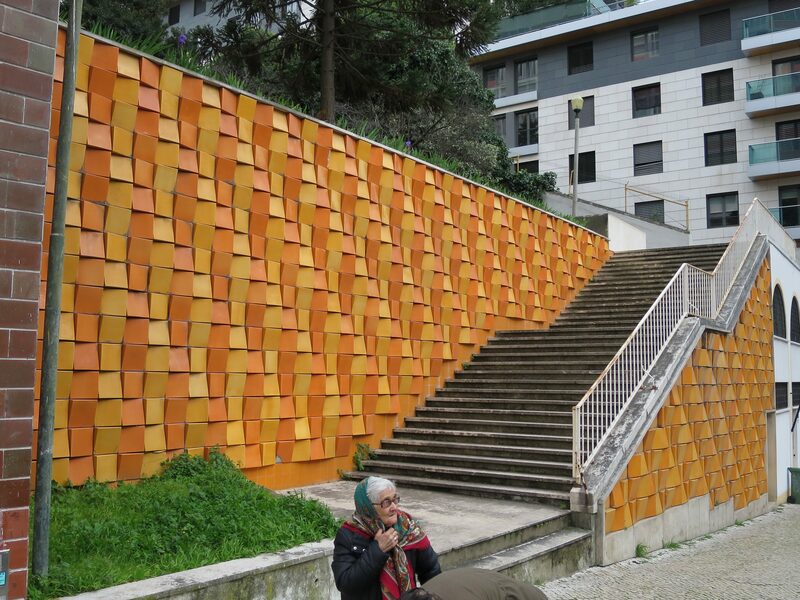 My visit to the Avenida Infanta Santo in Lisbon was to see the four large tiles murals installed there in 1959 as part of a large public housing project (see the previous post). 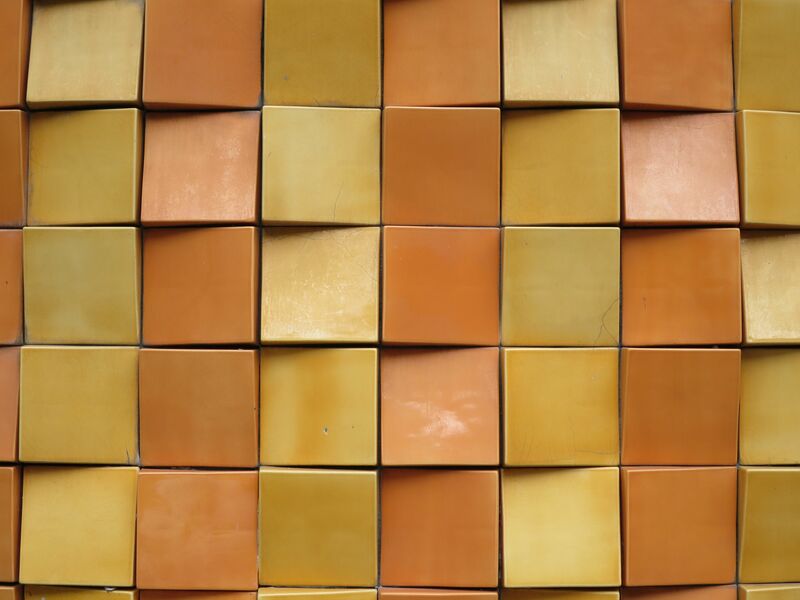 I had been lured there by a reference to them in a 1980s book on Portuguese tiles containing a brief mention and a couple of hazy colour plates. The chief target was the turquoise panel by Maria Keil. Having got very slightly lost looking for the road, I came onto it part way up the hill and walked on up to the bend where the flats are. They are on a slight bend of a steep hill which made it hard to see the whole thing at once. 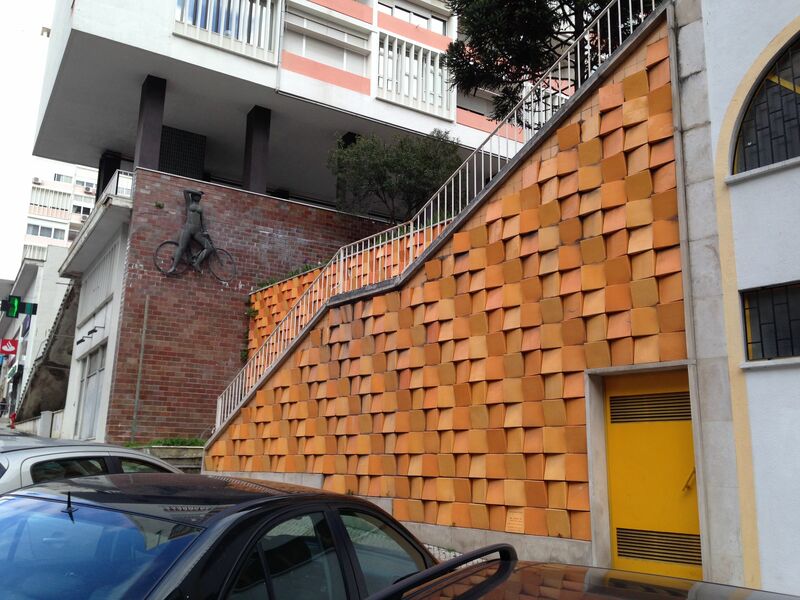 I was confused then to come upon a wall of bright orange relief tiles which I had not expected, just below the housing project itself. 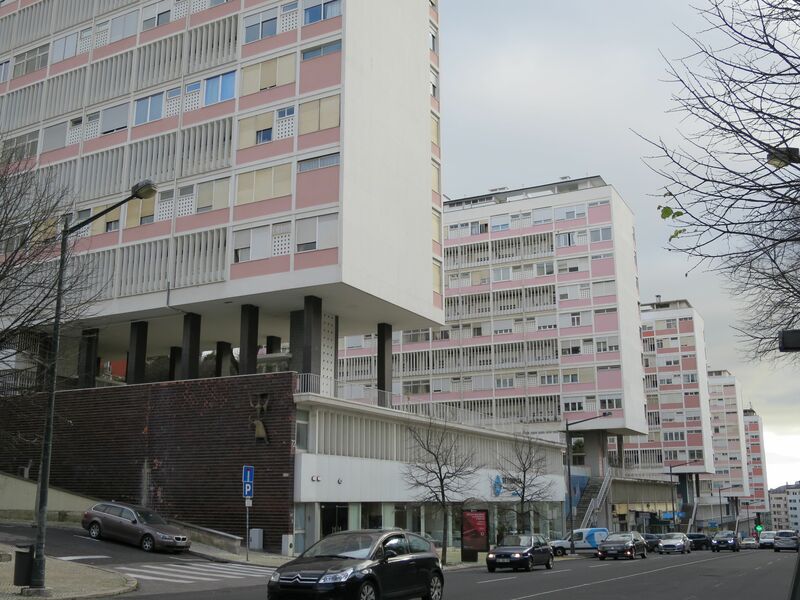 The extra wall and stairs were added below the original development in 1993-4 and the tiling designed by Eduardo Nery. It was part of the programme associated with Lisbon as European Capital of Culture. Nery was a Portuguese contributor to the Op Art scene producing Vasarely-like paintings from the 1960s and moving progressively into large scale public work both in tile and in cobbles. 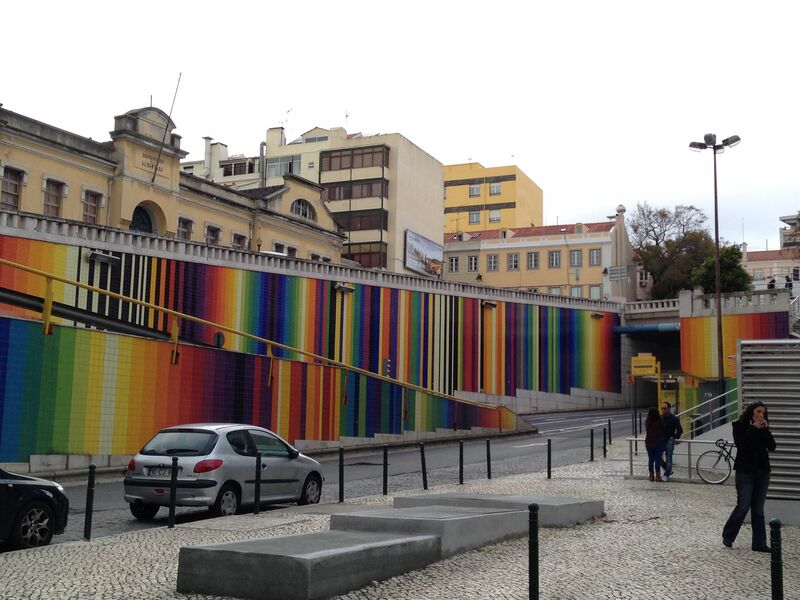 He been a major contributor to the revival of the patterned pavements of streets and public spaces in Lisbon. 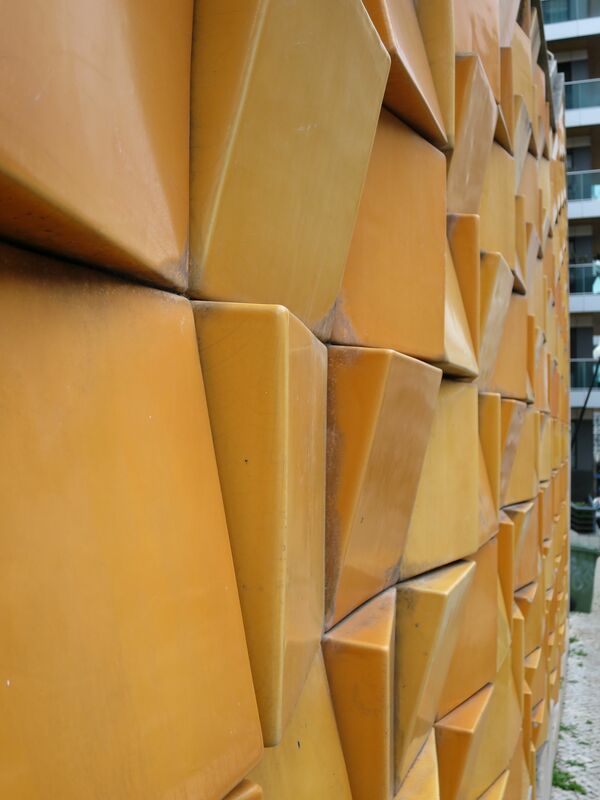 Here his bold oranges and use of relief is a fitting balance to Maria Keil’s luxurious blue-green panel at the opposite end of the development, the angularity and strength of colour echoing between them. Having explored to the top of the hill and admired the work from the 1950s, I set off down hill again to find my way back to the tram. 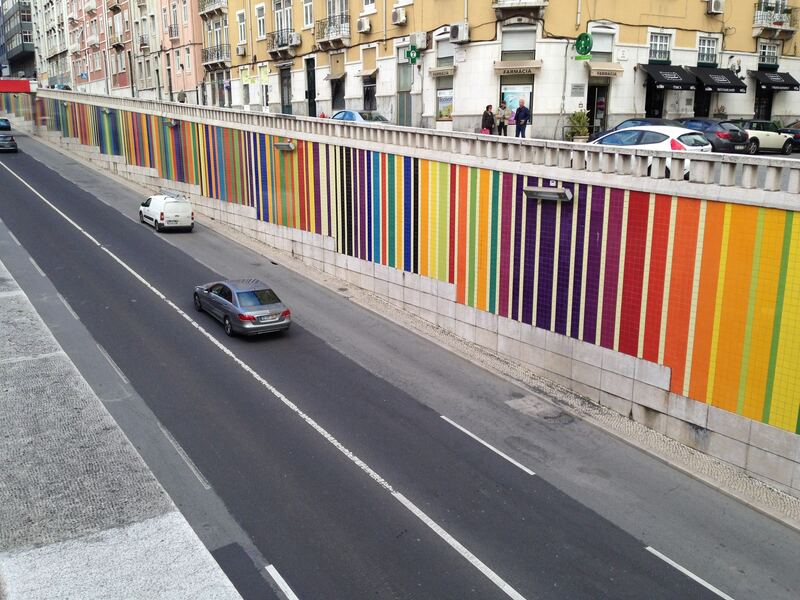 I was not expecting to see any more art – the Avenida Infanta Santo is pretty undistinguished. Or maybe not. I had got off at the wrong tram stop and had to cut through the side streets, missing the bottom of the hill and the junction of the Avenida with the main road from the city centre out to Belem. The city planners decided to build an interchange and underpass system here in 2001-2. 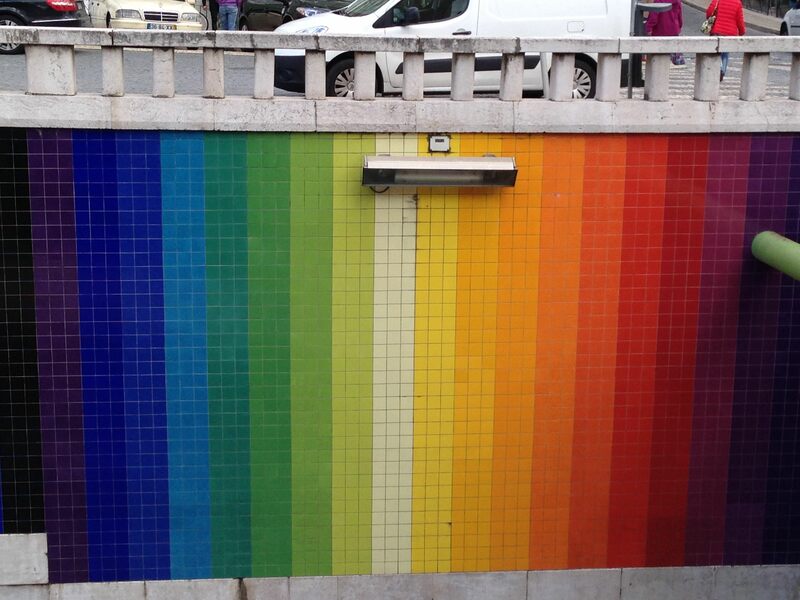 This is Portugal, why have a boring underpass when you have tiles! Who to commission but Eduardo Nery. Quite simply the best underpass I have ever seen. Amazing. 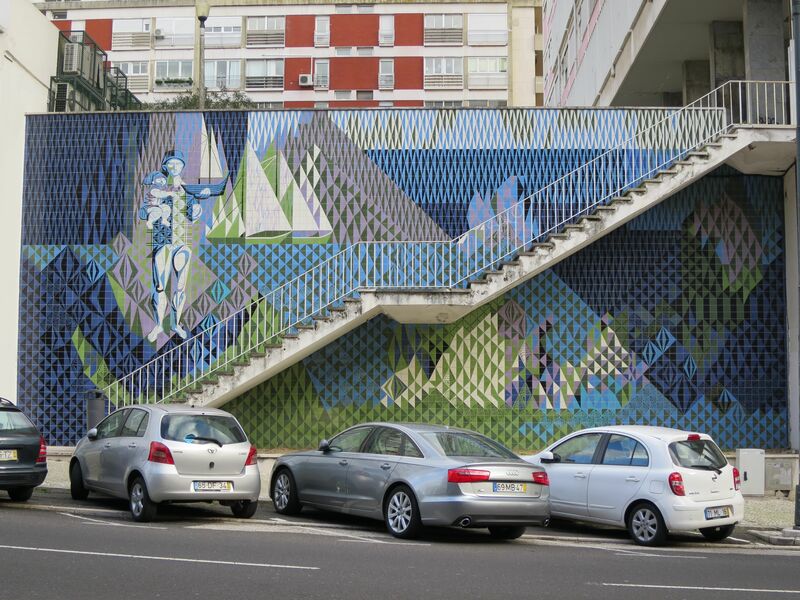 This entry was posted in Architectural Ceramics, Architecture, Contemporary Art, Lisbon, Modernism, Portugal, Studio Ceramics, Tiles and tagged 1990s, Avenida Infanta Santo, Azulejo, ceramics, Eduardo Nery, mural, public art, Street Art. Bookmark the permalink.